New reports menu: The old reports menu was replaced by the new module. Now, there are four boxes with a description, the available reports, scheduled reports and finished reports. All Delegate365 Admins can now select from new reports (1 and 2), activate a notification when finished (3) and start a report job with the Submit button (4). This creates a task in the schedules reports list (5). A job picks that task and executes it after a couple of minutes. When the report has been created, a notification can be sent to the report owner and the report shows up in the finished reports list (6). Refresh updates the reports boxes (5 and 6) with the current status if needed. Reports scope: All reports are filtered just for the entitled OU's of the signed-in admin. So, the report engine collects the requested data, looks up the entitled objects and delivers just a subset of all tenant data. Scope Admins can now use these reports for collecting data reports just for their relevant data. For example, if the logged-in Admin is entitled for OU's Seattle and New York, then the generated reports just sh ows users, groups and actions in these two OU's. Any data outside of these OU's is not shown. Options: Some reports can be filtered for a time range from 7 days up to 180 days, depending on the report type. The time range selection gets active or inactive then. Notifications: Since the generation of a report can take some minutes, it often makes sense not to wait for the result, but let the report engine send a notification to an email address specified in the notification field. The email comes with a subject "D365 Report engine" and a message as "Hi, this is a notification sent from your Delegate365 solution.Your report #64 OneDrive activity user detail was created successfully". Flow and operation: The user selects a report, the time range and if a notification shall be sent. When clicking the Submit button, a task is generated and the report request shows up in the scheduled reports. Each job gets a current number, #64 in this following sample (1). This identifies the report, along with the report name, the selected filter and the creator of that task. Every users sees just his own report tasks. So, the current number can be not continuously. There is a time span of about 3 minutes until the report job picks up the task. Within that time, the user could cancel the job with the trashcan icon (2). This is useful, if you find out that the scheduled job was a wrong report or the filter is not correct. Then, it makes no sense to execute the original report creation, but cancel it and create a new report job. Once a job is done, the resulted files can be downloaded (3 and 4). Report files can be deleted with the trash icon (4) as well anytime. Generated reports: Reports that have been finished show up in the finished reports list.This usually takes some minutes. 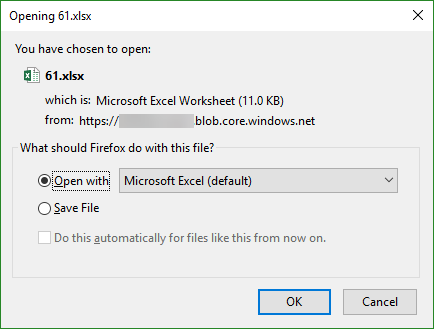 Once the job is completed, two reports are generated to download: a CSV file (a comma separated values text file) and a XLSX Excel file. Both files can be downloaded with the corresponding icons. The file name is the ID of the job, stored in the Azure temporary storage. With this output, data can be used in further systems for analyzing easily. This makes more sense than showing a graphics in Delegate365. Generated reports availability: Reports that are generated are available for the last seven days for download. After that time, the reports are automatically deleted from the Azure storage and from the finished reports list. Reports downloads are handled with a security token that is just valid for the signed-in user and a short time frame. So, only entitled users can download the report file and abuse is prevented. The CSV file can look as here: The OU name of the object is part of each record. See following sample reports by clicking on the image to enlarge it. More reports will follow with the next Delegate365 update. As soon, as Microsoft reveals more features to their APIs, we will integrate them into Delegate365. Old reports section: The old reports menu with sub menus for each report have been removed. This report data is no longer available from the Microsoft APIs, since they were depreciated. 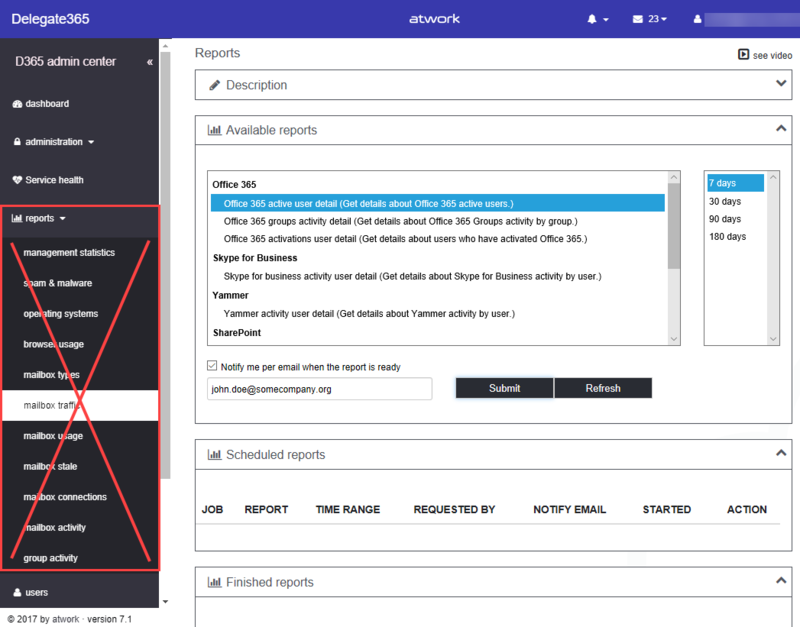 The new reports scale better and deliver much more functionality and useful data. Fixes: If contacts had notes with more than 250 characters, the sync threw an error. This has been fixed with Delegate365 version 7.3. Also, descriptions and labels have been updated. We think the new reporting engine in Delegate365 version 7.3 makes sense and delivers useful and reusable data. 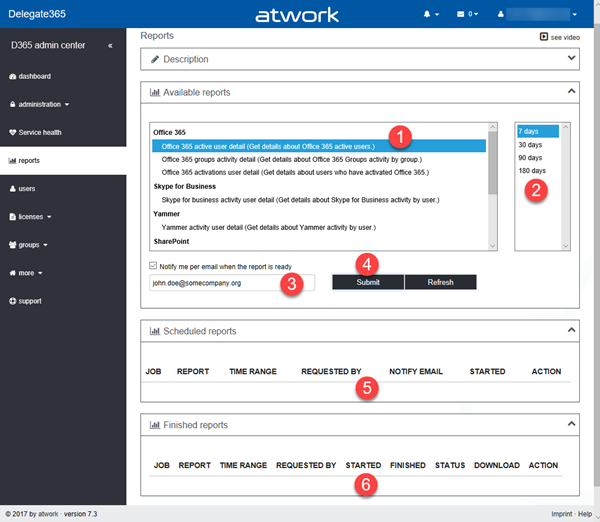 Delegate365 v7.3 will be updated starting mid of February to all existing productive environments. Hope you like it!